Eating gluten free used to be disappointing, but let me tell you, it has never been better than now! Way Better Snacks taste great, whether you are snacking while watching a movie on TV; or you are having a party, inviting all your friends, and getting dressed up. They are good with savory as well as sweet toppings and spreads. Here are a couple of recipes I made to go with my Way Better Snacks. Peel avocados and remove pits. Mash with a fork, leaving some lumps. Add the rest of the ingredients, and stir together. Cover with plastic wrap and refrigerate until serving. 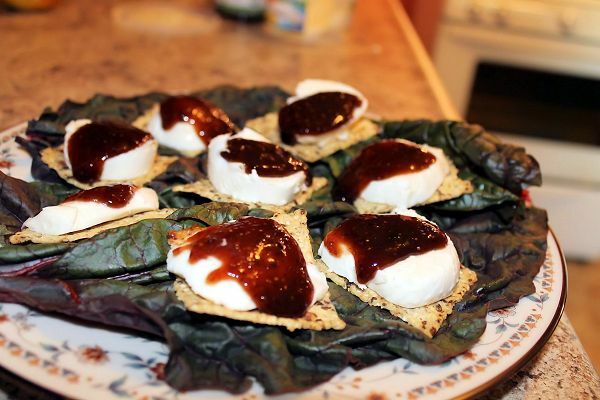 Cover your serving platter with greenery from lettuce, chard, kale or any you have on hand. If you have the little mozzarella balls, flatten them out between your fingers, and put them on a tortilla chip. Top with a teaspoon of fig spread. Place atop greenery on serving platter. Refrigerate covered with plastic wrap until serving. all with the goodness of sprouted whole grains and seeds. 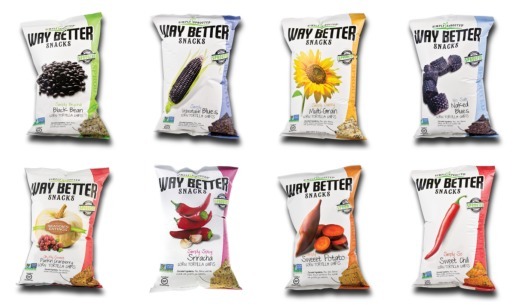 Way Better Snacks Corn Tortilla Chips come in eight different flavors like Multi Grain, Sweet Chili, Sweet Potato, and Black Bean. Way Better Pita-ahhh Chips come in Pinch of Sea Salt and Smoked Harvarti, and Toasted Garlic. The ingredients list for Way Better Multi-Grain Tortilla Chips are sprouted brown rice, sprouted daikon radish seeds, sprouted flax, sprouted quinoa, sprouted broccoli seed, sprouted chia seed, stone ground non GMO corn, sea salt, and sunflower and safflower oils. Find the ingredients for all their delicious flavors on the website. You can buy Way Better Snacks on their website, or click here to find a location near you. These look like some great ideas for a few Christmas get togethers at my house. Thank you! OMG – I won a 3 -month supply of Way Better Snacks at the SHift-Con Convention back in October. LOVE THEM!!!! I;ve got one more shipment. I love guacamole! I’d love to try those snack crackers! 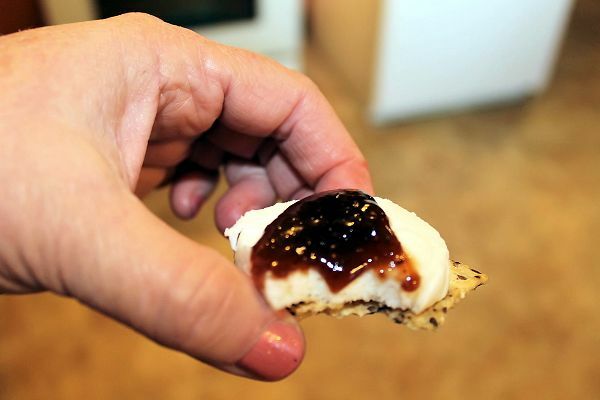 These sound great – fig spread and mozzarella sounds like a combo I’d sure like to try! I need to get some of these for Christmas and New Year’s! The varieties sound delish. What a great way to entertain for the holidays! I love having unique treats for guests! I love the idea of using pre-made snacks to put together unique holiday treats. I will have to pick some of these up. We do appetizers for Christmas Day with my family. These would fit in perfectly! Yum ! Those look so good. I would definitely make them for Christmas dinner. Especially that second one! Delish! I think these would be oh so delicious! I love that you combined the cheese with fig! Mozzarella cheese and figs. WOW! Sound amazing. I am going to try this for New Year’s Eve. I like your guacamole and these chips sure look delicious! 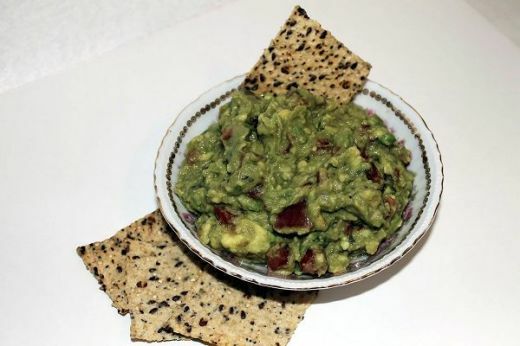 I would love to make the guacamole and have these chips for the Super Bowl! I want to make these for next weekend. Thanks. Those looks so good. I will have to try them out.